Week six was bittersweet for me. I did manage to score 5 Hits and only 1 miss (Sam Bradford) picking apart Christopher Harris of ESPN, but went 3-3 in my fantasy leagues for the second week in a row. Truth be told I would sacrifice all of my Hits and Misses for a winning week. Especially in the official Junkie League where I’m an abysmal 1-4-1. Not only that, but I’m head-to-head, with my wife this week who just so happens to be 6-0. I will not live this down for a long time. I feel it in my bones. But onto week seven where I’m sure much better things are in store for my teams. I’m an optimist. This week I’m choosing another ESPN analyst to dissect. It’s none other than Eric Karabell, our favorite fantasy ESPN Insider. I will be perusing his week 7 rankings trying to pick out the players he so rudely ranked low or possibly didn’t rank at all. Last week I hit big with Preston Parker and Lance Kendricks who both went unranked and both qualified as hits. I should be so lucky this week. But before I get into the exact players, I want to take a moment and welcome back Tim Tebow to fantasy relevance. So what if I have Tom Brady in an 18 team keeper league and spent 1/3 of my waiver money to pick you up. I BELIEVE IN YOU! 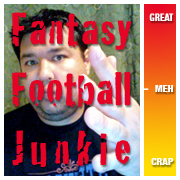 Not just the fantasy side of you, but the reality side as well… maybe this is coming out weird? Who cares, someone in that league is going to need a top 10 QB and when they do, they will come offering trades, I know it! I’m looking at you Jon Schaab. Going up against a defense that made Alex Smith look All-Pro, I believe Cutler will be a top ten QB this week. All he has to do is dump off to Forte who will run for 90 yards after the catch. Also of note, the Bears offensive line actually gave Cutler time to throw against the Vikings (who happen to be good at rushing the QB). But the Bucs are one of the worst teams in the NFL at creating sacks, sounds like a winning combo to me! It’s a shame Ricky isn’t on the Lions. They could really use him about now. It’s a shame Ricky isn’t on a team that will let him run 15 times a game. But that might change this week. If the Ravens are smart, they will get a lead early and play ball control, running 40 times in this game. If this happens, Ricky is sure to pile up 10+ carries. And for Ricky, that may be all he needs. But for him to crack the top 25, he will probably need a garbage time touchdown, totally doable against the Jaguars. Currently, Ricky is averaging 4.7 YPC. Going into the bye week, Breaston and the Chiefs were in a groove. Bowe, Cassell and Breaston were all putting up good numbers. To recap, the three previous games for Breaston totalled 11 REC, 196 YDS and 2 TD’s. Lets just hope the bye week helped and didn’t hurt the mojo for the Chiefs offense. My love for Kendricks this year is well documented. He went unranked last week and came through for me cracking the top 10. He’s got two games with 4 catches in a row and only dropped one ball against the Packers. For him, this is a big improvement. I think with the addition of Lloyd, everyone will have an easier time getting open. I believe he continues his hot streak and catches at least 4 again. Only owned in 1.4% of ESPN leagues, this will move up after another solid performance. If ever there was a week to jump on the Bronco’s for one game, this might be it. With Tebow mania taking over and Denver travelling to Miami, there might just be more Tebow fans than Dolphins fans! The Bronco’s players are going to be amped up for this one, and with all of Miami’s troubles this year, now is the time to start the Bronco’s if you need a DEF. If you have any start/sit questions, hit me up on the twitter @ffootballjunkie or leave a comment here! Sorry dear, but YOU’RE GOIN DOWN!!!!! Ha, I believe you. But it’s fantasy football and anything can happen!